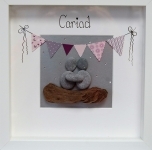 Beautiful handmade pebble pictures from Swansea in Wales. Can be ordered as seen or personalised to suit you. Each will be slightly different due to differences in pebbles and driftwood. Lovely white frame measuring 23cm x 23 cm. Allow 14 days for delivery as made to order. See our examples and order on website and email dragoncrafts@hotmail.co.uk with personalised details. Please add ages of children to ensure pebble sizes are appropriate!! Crystals if required and colour white or silver on bottom. Handmade pebble picture All You Need is Love and a Dog. Handmade pebble picture. Anyone can cuddle only the Welsh can Cwtch. Coloured bunting. Handmade pebble picture. 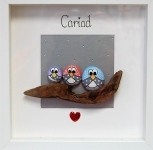 Cariad - three coloured owls and red heart. Handmade pebble picture. Cariad, couple on driftwood log with pink bunting. Handmade pebble picture Caru Ti, Translation Love You. Two flowers and a butterfly. 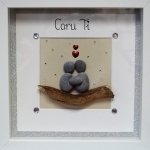 Handmade pebble picture Caru Ti (Love You) Crystals on four corners and two red hearts.